DASHBOARD DRIVER: An advanced Lidar system developed by Velodyne for the 2005 challenge will be onboard some of this year's vehicles. As the agency that created the Internet and nurtured it through its early years, the Defense Advanced Research Projects Agency has a long history of transferring its technical innovations from military to civilian use. The Grand Challenge will likely prove to be another example. Although the challenge's primary goal is developing driverless military vehicles, DARPA has organized the competitions with the expectation that technologies created for them will be applied in the private sector, too. Many of the corporate Grand Challenge participants, in fact, look at it as an opportunity to test and perfect ' in demanding military conditions ' technologies they will later adapt for industrial or civilian use. Velodyne Acoustics, a maker of high-fidelity stereo and home theater equipment, entered the 2005 Grand Challenge and invented laser-based sensors for its vehicle that it has now sold to participants in the 2007 Urban Challenge. The company also is marketing its invention to prospects in several industries, said Michael Dunbar, Velodyne's business development manager. David Hall, the company's founder, chief executive officer and chief engineer, along with his brother, Bruce, Velodyne's president, entered a vehicle in the 2005 Grand Challenge as Team DAD (for Digital Audio Drive). While working on the project, they identified shortcomings with the laser-based light, distancing and ranging (Lidar) scanners used alone or in combination with cameras as the eyes in the guidance systems of autonomous vehicles, Dunbar said. 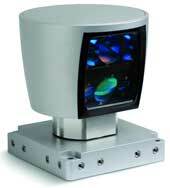 Lidar systems available on the market at the time scanned for objects only along a single, fixed line of sight. In response to those limitations, David Hall, an avid inventor, created his own Lidar scanner consisting of an assembly of 64 lasers spinning at 300 to 900 rotations per second capable of detecting objects anywhere in a 360-degree horizontal field. The Velodyne Lidar assembly produces 1 million data points per second, compared to the 5,000 data points a second of earlier systems. Velodyne doesn't have a vehicle in this year's Urban Challenge but has sold its HDL-64 Lidar scanner to 10 Challenge participants that have included it on their vehicles, either alone or in conjunction with optical sensors, Dunbar said. 'Some of the teams can use our sensor and eliminate other types of sensors so [the sensor data] is much easier for them to manipulate,' he said.